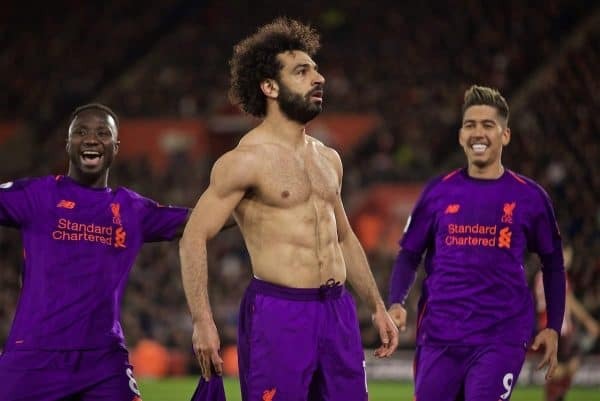 Liverpool toiled away after going a goal down at Southampton, but two late goals—including a record strike from Mohamed Salah—sealed a crucial 3-1 victory. Just five days on from one of their most important wins of the season, the Reds were back on the road and in Hampshire as they took on Ralph Hasenhuttl’s Saints. 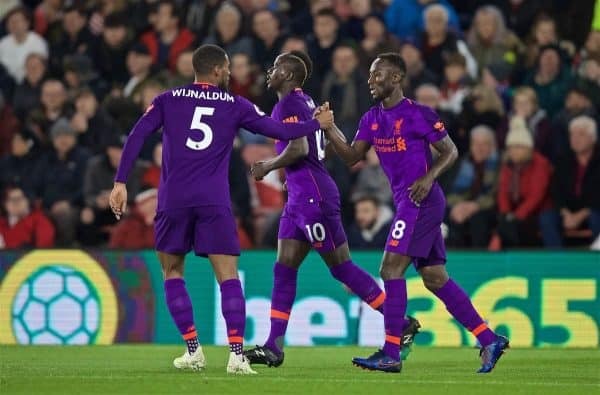 With victory ensuring a return to the top of the Premier League, and Man City in FA Cup semi-final action on Saturday, the pressure was on Liverpool to secure another three points. Jurgen Klopp made two changes to the side that beat Tottenham at Anfield, as Fabinho and Naby Keita returned to the side at the expense of Jordan Henderson and James Milner. The Saints are still fighting the drop, and therefore served as another tough challenge for Liverpool, and while the hosts made sure that was the case their quality eventually shone through. The Reds came out to a loud, manufactured atmosphere at St Mary’s, and the home supporters booed Virgil van Dijk‘s every touch in a desperate attempt to unsettle their former centre-back. It was a mixup between Van Dijk and Joel Matip which gifted Southampton their opener, with Ryan Bertrand’s cross evading Matip and, with Van Dijk too slow to catch up, the ball was flicked on for Shane Long to fire home. Liverpool had a great opportunity to equalise soon after as a result of Matip’s mazy run, but Sadio Mane‘s header was stopped by Angus Gunn and Keita was unable to steer the rebound on target. He managed to 20 minutes later, though, as a lofted ball over to Salah eventually landed to Trent Alexander-Arnold after a series of crosses, and the right-back’s delivery was steered past Gunn by the leaping Guinean. 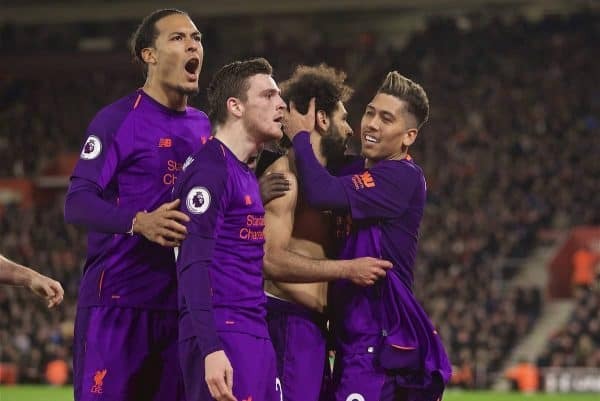 While they certainly grew into the game as the half wore on, the Reds struggled for quality against Southampton‘s low block, and the break came with the scores at 1-1. Little changed for Liverpool directly after half-time, despite a clear foul on Keita in the penalty area being waved away, and Klopp made two changes on 59 minutes as Henderson and Milner came on. Henderson provided industry in an advanced role after replacing Gini Wijnaldum, with the manager clearly looking to inject energy into his side as they grew lethargic. The ball almost dropped to Roberto Firmino for a great chance on goal, but Maya Yoshida did well to read it and make the block, as the Reds pushed harder for a vital winner. It eventually came as Henderson found Salah with a headed clearance, with the Egyptian charging the entire home half and firing past Gunn for his 50th league goal for Liverpool in just 69 games. Henderson wrapped the game up to cap an emphatic cameo, charging into the box to touch home a Firmino cutback, roaring at the travelling Kop in celebration as the Reds moved back to the top of the table.